All Pearland Soccer Select coaches are USSF Licensed coaches. 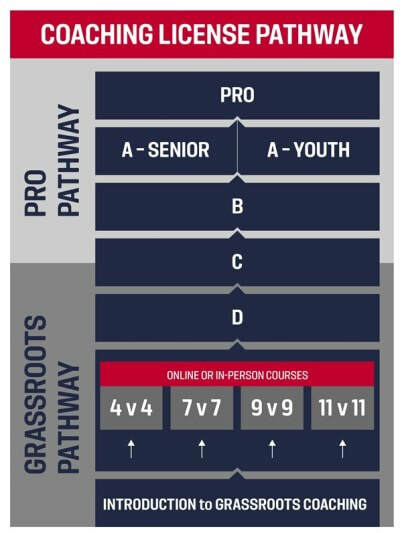 New coaches are required to complete our Advanced Coach Training classroom and field sessions and must obtain a minimum USSF Grass Roots 9v9/11v11 (or USC equivalent) within one year of coaching debut. In addition, a signed agreement is required-confirming the coach agrees to be mentored, accept direction for improvement, and align personal preferences with Pearland Soccer's coaching philosophy and style of play. Recreational coaches will have access to written and video curriculum and will have the opportunity for on field mentoring and training sessions. All recreational youth coaches are expected to obtain within one year an introductory license from either US Soccer or United Soccer Coaches. Select coaches must attend Pearland Soccer's Advanced Coach Training Program and obtain either a Grass Roots 7v7/9v9 or USC 7v7/9v9 license.